Mark the special moments in your life with PANDORA. Whether it's an anniversary, the birth of your first child, or your sister is moving away to college there is PANDORA charm that will make that special moment one to that will be remembered and cherished for years to come. Be certain it won't be "just another anniversary" by giving PANDORA this year. Make it a birthday present she will always remember with PANDORA. The most special day of your life calls for a gift out-of-the-ordinary to mark the occasion. Make opening presents under the tree a moment she will never forget with these charms. Special charms and beads to celebrate Easter and springtime. PANDORA beads make special gifts that celebrate special friendships. 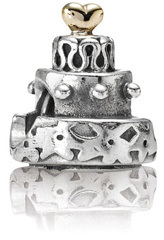 Charms and beads to mark an important milestone in anyone's life. Spooky ghosts and black-and-orange beads make Halloween fun! Day PANDORA charms are the perfect way to let mom know how much you appreciate all she does! Celebrate the birth of a new baby girl or boy with these beads. Day Better than roses and candy, PANDORA makes the perfect gift she is sure to love.